I’ve heard the saying, “What you don’t know won’t hurt you.” When it comes to diabetes care, what you don’t know can kill you. I didn’t know my blood sugar was going below 55 in my sleep. I didn’t know how often my blood sugar was below 70. Turns out it happens to me a lot. My blood sugar drops so gradually I don’t notice. How often have I tested and been surprised I’m low? I also didn’t know my blood sugar takes off like a missile. 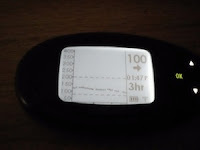 Testing 2 hours after a meal didn’t show me rapid rises in blood sugar 40 minutes after eating. Dexcom did. My A1c of 7.2 made me feel like I’m doing much better. Finger stick tests in range almost all the time gave me a false sense of doing OK. Dexcom showed me I’m not doing OK. I’m not doing OK at all. I’ve had trouble sleeping this week. I guess that makes sense. Waking up to Dexcom vibrating and showing LOW, no numbers, just LOW scared me stupid. I’ve been scared of going low in my sleep and not waking up. I don’t always realize I’m LOW when I’m awake, let alone when I am asleep. I’ve overcompensated by eating a little ice cream as a bedtime snack. Well, a ½ cup of Reese’s Peanut Butter Cup ice cream in a dish. I mean in a cone. OK, in a cone that is first slathered with Jiff Peanut Butter. What can I say, I’m a chocolate and peanut butter junkie. Besides, it was medicinal ice cream. Half peanut butter and half ice cream has kept me from going low at night, as far as I can tell. At least I haven’t woken up crying from low blood sugar. I have woken up scared, though. In just a week I got used to knowing what’s happening behind the scenes. I got used to looking at the Dexcom and seeing how I was trending. Can I take Honey for a walk now, or do I need to eat a snack first? Can I go Wii Fit now? Or do I need to eat first? Was that a smart thing to eat, or not? Did I bolus enough for that cookie? All of this information helped me so much. I’ve missed it. My new Dexcom is coming today. Tonight I’ll have the Dexcom beside me in bed. I’m grateful to all the people who helped make that happen — my medical team, my insurance company, the people at Dexcom, & my family. I’m grateful for all the d-bloggers and the #DOC. I’m grateful for all the people with diabetes who fought battles with their insurance companies to get their continuous glucose monitors covered. Without their fighting spirt, I wouldn’t have the tools I need to fight. I wouldn’t have the support I need to deal with diabetes. Oh! The dog is barking! Gotta go! My Dexcom is here! Yippee! That's awesome!! I'm excited for you!! Thanks Carrie. I'm so relieved to have this tool to help me.